If you are looking for an idea to use up your leftover mashed potatoes, whether it is white or sweet potatoes, Gnocchi, or Palushky, are your best bet. With Thanksgiving coming up, you just might want to keep this recipe in mind, as for sure you will have some leftover potatoes to turn into a new dish. To avoid redundancy, I will not repeat the recipe, but will rather ask you to check out my recipe for “Palushky”, and substitute the white potatoes with sweet potatoes. Everything else stays the same. If you choose to make them look more like Gnocchi, rather than Palushky, you may do this by forming a dough log about 3/4 inch in diameter, then using a knife, cut it up into 1 inch pieces. Try it, and I am sure you will like it. 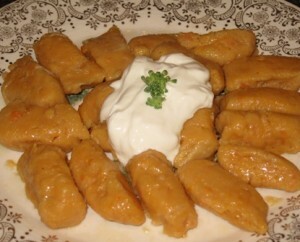 If you really like sweet potatoes, you can also use them for varenyky (pierogi) filling, which makes them really yummy. I prepare the filling the same way as from white potatoes, with the exception of substituting the cheddar cheese with cream cheese. I love sour cream, hence the accompaniment to the above Sweet Potato Palushky/Gnocchi. I made these on Sunday night, as I had left over sweet potatoes in the fridge. They turned out delicious. Instead of fried onions, I concocted a little butter with brown sugar and cinnamon. It was a nice complement to the meal. I am very pleased to hear that you tried this recipe and it turned out to be a success. Oh, I can almost taste the wonderful butter/brown sugar/cinnamon sauce on these sweet potatoes gnocchi. I bet I could add the cinnamon and brown sugar to my sour cream and it would be delish as well. I appreciate your comments and a great tip.